Good cheap bass amp heads should give you all the power you need for the stage and studio, with the definition and presence to keep you firmly in the mix. Don't settle for weak, inarticulate and sterile rumblings just because you're on a tight budget! The bass head market is full of junk that users have harshly rejected across the review sites and forums. In fact, it appears bass players are far more discerning than thinner stringed guitarists when it comes to their gear. So rest assured, the 3 picks featured below are the very best in their price range - under $300. Defining Features Small, lightweight, minimalistic controls. Clean, vintage rock sounds with that typical Ampeg wooliness bassists have come to know them for and, as understated in the manual: "much smaller than Stonehenge". Sensibly stripped down to the essential features, with only 5 knobs to tinker with - bass, mid, treble, gain and master volume. Active/passive input, limiter switch and line in/out sockets complete the front section with a balanced (XLR) output and standard effects loop jacks at the rear. Perfect for those who just like to plug in, dial up and play without feeling like they're tuning up for a spacecraft launch or those with external tone shaping modules looking for a basic, blank canvas. 200 watts may not be monstrous power for a solid state bass head, but with a good 18" driven cab, the VR bass head will deliver a surprisingly big sound for such a small package. The Micro preserves, rather than enhances or masks, the natural tone of your bass with a clean, woody authenticity. The seemingly limited EQ is efficient and dynamic enough to bring out the best in your bass without completely saturating the tone. The Micro VR cab gives you the roundness to compliment the head. It's recommended you marry the VR cab with its head for the best sound. The result is vintage-leaning tones suited to traditional rock and blues (although that is of course subjective). It's true that some may find it slightly sterile, while others hear a certain rawness that gracefully harks back to the lo-fi garage rock of the 60s, with enough of that typical Ampeg warmth to cushion the brashness. A twist of gain will give your tone some grunt, but nothing to bring the house down. It's a clean amp and any gain you add is simply to thicken things up and add more of a percussive "thunk" to the attack. The Micro delivers a wonderfully natural, woody punch that Jazz Bass players will especially love. Every little bit of fret buzz, every neck slide, every pop as the finger hits the string, the Micro VR has a way of making it sound as much a part of the music as the notes themselves. At a mere 14 robustly packed lbs, it'll almost take itself to your small-mid size gig venues, at which it will deliver all the volume you need. 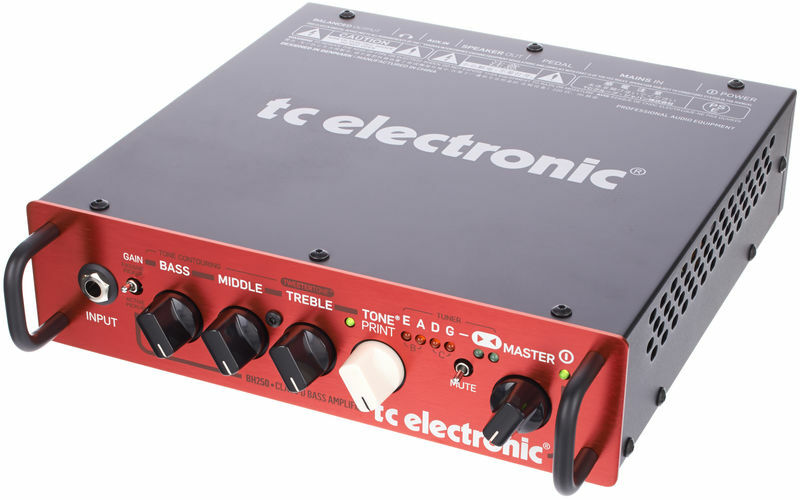 For $300 this is a top bargain in the bass amp heads department. Another micro 200 watter. Ultra portable but with a slimmer form than the Ampeg. 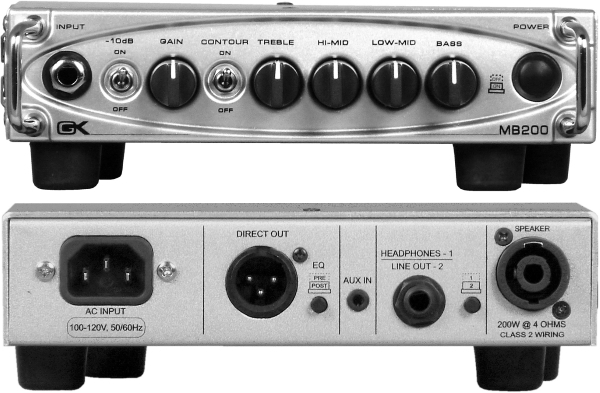 Like the Micro-VR, the MB200 has an output reduction switch, for those with active basses. On the EQ, we have additional dual mid controls for shaping that mid-range more precisely. The contour switch gives you even more control over the mids with a preset mid-scoop effect. Sometimes it's the little things, such as any problems with the head being indicated through the power switch. Blue = everything's OK. The balanced XLR output gives you quality front-of-house, pre-EQ or post-EQ line out. 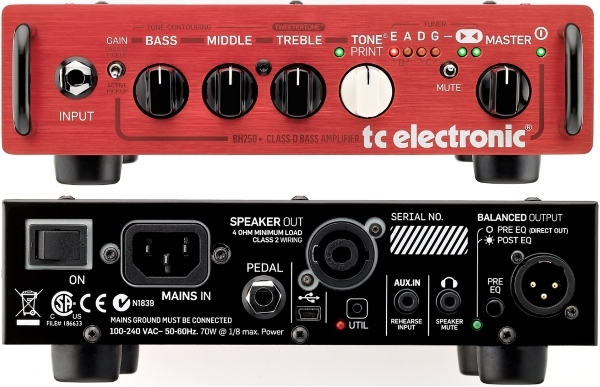 A switch controls whether or not you want the XLR signal to be coloured by the onboard EQ. There will be times when this is useful, although it's true that most line recording is taken pre-EQ and then EQ'd in the D.A.W. Keep in mind there's no effects loop so you'll need to take them through the main input. But there's enough on board in the way of raw tone to satisfy most bass players. With the obvious benefit of a decent amount of power coming from such a compact head, users seeking that signature, punchy GK sound, with an easily attainable growl, will not be disappointed. At the same price as the Micro-VR, the real decision maker will be the higher degree of on board tone shaping vs lack of effects loop. More technically equipped than the two other picks, with an on board tone bank, on board tuner and more sonic tone shaping capabilities. The TonePrint feature allows you to download a wide array of preset EQ and effects from the TC Electronic website. The Prints can then be loaded to the head via USB input. This feature alone creates a clear comparison point with the other heads. If you like complete control over your tone, but don't want the clutter of external pedals, you'll appreciate the TonePrint feature. A special footswitch pedal (the Switch-3) can be used to manipulate the TonePrint and mute functions - the latter being useful for when you're tuning up on stage. The BH250 packs 250 watts giving you significantly more power than the VR and MB200, confirming it as a capable gigging head for any small-mid size venue. Like the MB200, you can choose between a direct or post-EQ XLR output and switch between passive and active inputs. 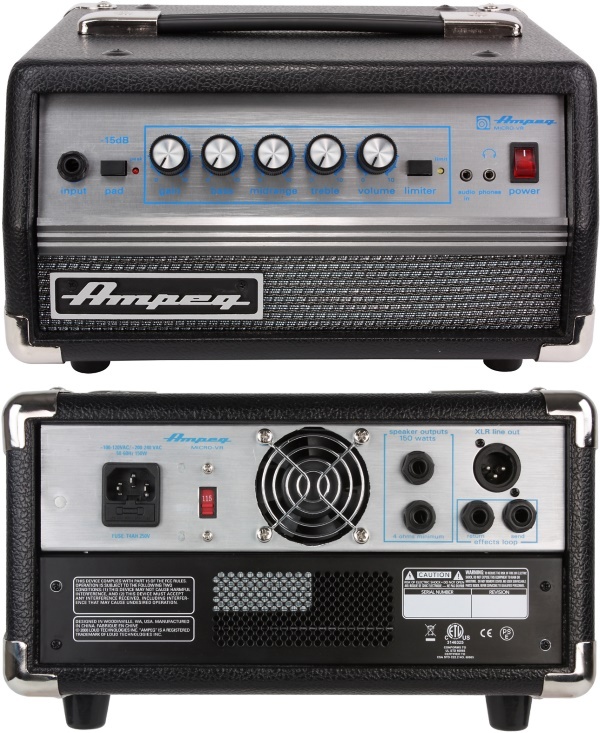 So it has all of the standard features found on the Ampeg and GK offerings, but with some extra goodies (the tuner is a nice touch) and that additional level of tonal shaping and optional on board effects. And all for... the same price! However, it's not as much of a "no brainer" as it may seem, because some players do prefer a more minimalist setup, for various reasons. Only you know how much the tone bank and effects will mean to your playing. You may also miss the analogue, progressive gain control. Gain is instead set through the TonePrint function so it's more on/off. Other than that, you get a lot of head for your money with the BH250 and a great degree of precision in finding a sound you want.